Our Plas Caerdeon Outdoor Education Centre in North Wales delivers residential outdoor activity courses to a wide range of external groups, including schools, youth groups of all ages, University students and staff. The outdoor activity centre, a member of the Association of Heads of Outdoor Education Centres (AHOEC), is set in 18 acres of private, secluded woodlands within the Snowdonia National Park, North Wales overlooking the Mawddach Estuary - often described as one of the most beautiful in Britain. Plas Caerdeon is available for schools to hire and bring pupils for day/multi-day trips. Find out how we can help your school. If you’re looking for a team-building day with a difference, Plas Caerdeon could be for you. Find out more about how we can help your business. As a central location for research particularly in the fields of environmental and biological studies, Plas Caerdeon is a practical base for a range of research. Find out more about fieldwork and research opportunities. 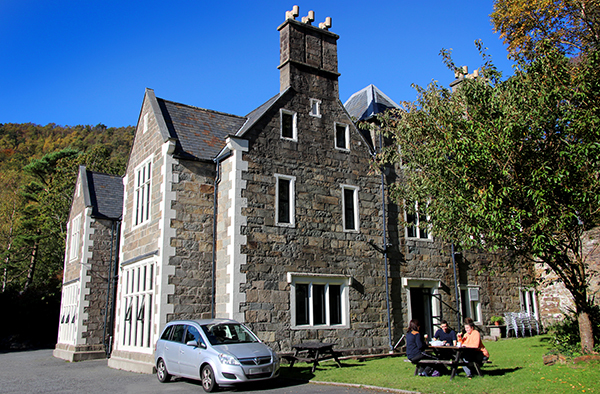 As well as an educational centre, Plas Caerdeon also has self-catering accommodation on-site for anyone looking for a relaxing weekend away in the beautiful surroundings of Mawddach Estuary. Find out more about staying at Plas Caerdeon. Not sure where we are or have a question you want to ask us? Visit our contact us page for directions and contact details.